When I think of a traditional French manicure, it just immediately feels so... 15 years ago. Until I noticed backstage during Fashion Week Spring 2011 and Fall 2011, that a fresh version of the French kept popping up. The runways of Ruffian, The Blonds and Jason Wu are exemplary of the new twist on the French, which usually involves a light base color paired with a vibrant, bold tip for contrast, ranging from neon pink and bright blues to shiny black and even textured metallic. So what has sparked the resurgence of the classic nail look? "There has been a move toward all things retro in the past few seasons, and the nail world has been included in that," explains butter LONDON Creative Director Nonie Creme. "It's not to say we are taking things too literally, just that now's a great time to reinvent traditional looks. The addition of color and pop to an old-school French feels right on trend." CND nail professional Roxanne Valinoti concurs: "Everything old becomes new in spring! The French manicure has been a classic nail style since the '20s. While the standard pink-and-white look seems dated and passé, kicking it up with some colorful options is youthful and fresh." Adds celebrity manicurist Elle Gerstein, "I think that the infusion of color on the runway has become such a trend because polish has become a statement as an accessory. One of the coolest new trends in French manicures is the chevron reverse French -- instead of a moon you see a V at the base! Jennifer Lopez is a great example of a celebrity who has embraced the French trend; we've swapped her whites for glitter shades." StyleList also spotted the almond-shaped nail making a prominent comeback, especially paired with French tips to provide an elongated, elegant shape. "I love almond-shaped nails," exclaims Creme. "They are the stilettos of the nail world. I hope they do stay around -- I'm desperate to banish blocky, masculine looking squares for a good, long while!" So what are some cool color combos our nail experts are loving for spring? Valinoti goes metallic: "I love the contrast of (CND) Perfectly Bare Colour with Silver Chrome -- we did a variation on this manicure at Behnaz Sarafpour, where the perimeter of the nail was roughly outlined in silver. The designer wanted the nails to be inspired by gardens. At-home nail addicts could take these two shades and make a gorgeous French manicure." Creme thinks pale: "I am loving (butter LONDON) Lady Muck with the tips done in Teddy Girl . Gerstein goes for the color burst: "Some cool versions of color contrasts are essie Coat Azure as a base with Aruba Blue (deep ocean metallic blue) as a tip. Or try essie Tangerine with a hot pink tip such as Super Bossa Nova. A classic twist can be Sold Out Show with Pink Parka... as seen by superstar Cassie." According to Valinoti, "To get a clean version of the French, apply base coat (we love Stickey), paint on two coats of base color, then carefully ice the tip of the nail with two coats of desired color shade. Finish with top coat over the entire nail in Super Shiney or Air Dry." 2. 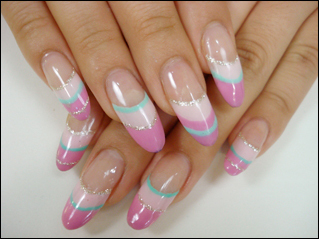 Let the color dry completely before applying the French manicure decals to the tips of each nail. 3. Brush on an opaque neutral to the rest of the nail and peel off the decal when finished! Gerstein says, "The simplest way to assure perfect smile lines is to divide the nail in half and then paint from side to middle. This allows a perfect line...If you can't paint those perfect lines, Sally Beauty sells great guides for French manicures. Use them to create the lines, but super important: wait until polish is set before removing!" If your goal is to get the true French look with just bright tips as a contrast, here's one final piece of advice from Valinoti: "Just like when wearing a bright accessory in your wardrobe, it is always best to keep the base shade neutral and warm."